This recipe is simplicity itself. 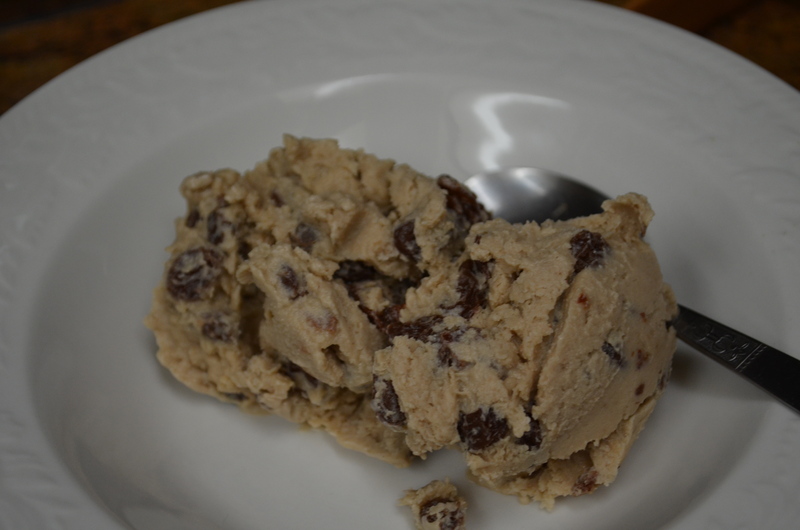 Rich, creamy, and not too sweet, with little pockets of intense raisin/rum flavor. It includes cashews and alcohol, both of which disrupt the formation of ice crystals while the mixture is freezing, and so help to make the ice-cream smooth. Soak the raisins in the rum for at least 1/2 hour, turning them through once in a while. Put 8 fl oz (1 cup) water and the cashews into a high speed blender, and process until completely smooth. Transfer the cashew mixture to a saucepan with all the remaining ingredients, use another 8 fl oz (1 cup) of water to rinse out the blender into the saucepan, and bring to a simmer until thickened, stirring continuously as it starts to boil. Allow to cool, then pour into a freezer-proof container and freeze for approximately 4 hours, stirring every hour or so. At this point, the ice-cream is still soft enough to serve. If it is left for longer in the freezer and gets too hard, you might want to allow it to defrost slightly in the fridge for 1/2 hour before serving. For a variation on a theme, make Prune and Brandy ice-cream by substituting 5 oz prunes for the raisins, and brandy for the rum. Blend the prunes and brandy with the cashews. Reminiscent of warm, sticky gingerbread, this pudding is definitely comfort food. Opinions in our household are split over whether to peel the decorative oranges before use, as they make eating the pudding a little more difficult, but add an interesting tang. Once you’ve collected all the ingredients together, putting the pudding together is a quick process, though steaming it still takes a bit of time, and the house does fill up with homey sweet gingery smells while it’s at it. The marmalade I use for this is a fairly tart, tangy, homemade affair. If your marmalade is sweet, you may want to avoid adding the sugar as well. 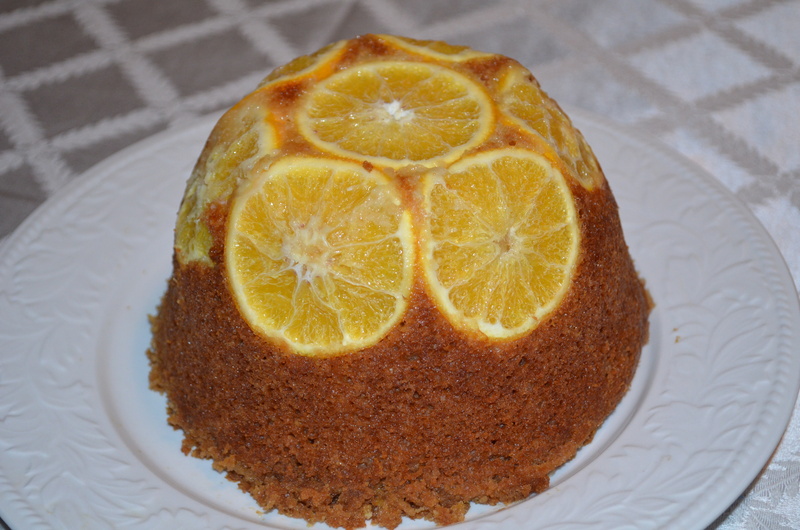 Gluten free, warm Orange and Ginger Steamed Pudding. Grease the inside of a 2 pint pudding basin; line the bottom with a piece of parchment paper, and re-grease that again, too, to stop the pudding from sticking to it. Arrange the slices of orange artistically around the bottom of the bowl, and (if using) pour the 1/4 cup of marmalade onto the orange slices. Beat the two eggs in a food processor for 10 seconds. Add the margarine to the egg, and beat for another 10 seconds. Add the apple sauce, and beat that in too. Add the remaining ingredients (except for the milk), and beat briefly until all has been incorporated. If the mixture seems at all dry, add the milk; it should be a thick batter. Scrape the batter into the prepared pudding basin, and cover with a sheet of parchment paper, then a sheet of foil. Secure the lot with a piece of string such that steam is prevented from getting into the pudding, and a handle is formed for ease of removal from the steamer. Using a steamer (or a large saucepan with a trivet or crossed forks in the bottom to prevent the pudding from scorching on the bottom of the pan) boil a pint or so of water (such that it doesn’t touch the bottom of the basin). When the water has reached boiling point, put the pudding in the steamer/saucepan, add a lid to stop the water from evaporating, turn the temperature down so the water maintains a gentle simmer, and cook the pudding for 1 1/2 hours. Check that there is still water in the pan every 1/2 hour or so, and if it’s low top up with boiling water. Once the steaming time has passed, remove the pudding from the steamer and the parchment and foil lid, put a serving plate over the top of the pudding basin, and in one swift movement (using oven mitts) turn the pudding basin and plate over as one. The pudding should fall onto the plate, and you can use the edge of a table knife to lift the edge of the basin so you can remove it. Cut into slices, and serve hot with custard, cashew cream, or soy ice-cream. This dish is well suited for using up left over gluten free cake that has started to go a bit stale. Don’t assume that means it is not suitable for company! It just allows the cake to absorb the fruit and wine flavors better. I serve individual servings in wine glasses, so the pretty layers are visible while the dish is still pristine, but for family fare, you can use a single larger bowl, and dish up at the table. I’ve given a range of marsala/sherry to add to the fruit; use the greater amount if your cake is particularly dry. The liquid from the fruit/sherry is absorbed by the cake. I’ve also used left over steamed pudding for the cake layer, and that was also successful. The custard layer I use is made with soy milk (not soy milk and water), as this is a particularly rich dairy free milk, which goes well with the sharp fruit layer. Mix the blueberries, apple sauce, marmalade, and marsala/sherry together in a mixing bowl. Check for sweetness levels, and adjust if necessary. If the cake is at all dry, make sure the fruit layer is juicy so the cake will be well softened. Break the cake into chunks, and make a layer about an inch thick in the bottom of your serving bowl(s). Put a similarly thick layer of fruit on top of the cake. 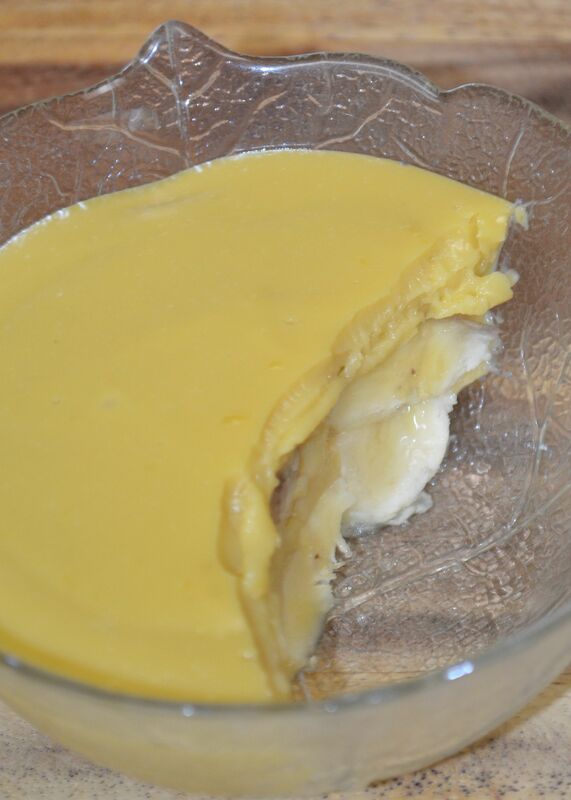 Carefully pour a final layer of hot custard to a similar depth, over the fruit. Put the serving container(s) in the refrigerator to chill for at least half an hour before serving. That word ‘pudding’ causes a whole heap of confusion to Brits in the USA. Just so as we’re clear, in the USA, the word ‘pudding’ appears to denote what the Brits refer to as custard, which is a pretty specific, vanilla flavored, cornstarch or egg thickened, sweet sauce for serving with apple pie/crumble/trifle or even on its own as a private, pretty gratuitous dessert. For my American friends: the word pudding is another word for dessert in England. I have lived in the States for about 15 years now, and have picked up a good many habits (verbal and physical) from the locals, but I cannot bring myself to think of custard as ‘pudding’! 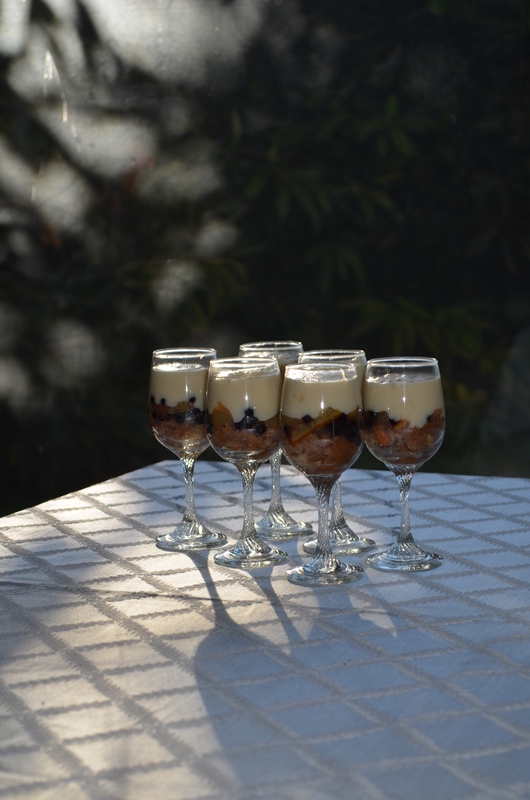 Trifle topped with home-made, uncolored custard. Now, if you happen to live in the UK, this recipe is going to be pretty superfluous, since Birds Custard is universally available, even in corner shops and petrol station stores. As someone who doesn’t tend to eat dessert (even saying the word adds another inch to my waist), I can’t say I’ve actually looked for custard here in the USA, but the familiar package does leap out at me when I’m in stores that cater for the local British contingent, so we generally have some in stock. Not always, though! So, if you’re caught short with no commercially prepared custard powder (social faux pas in our household), or you happen to live in some part of the USA which doesn’t have a strong British presence, this could be useful. The recipe below describes adding boiling milk to the starch and flavorings. Although it sounds illogical, the texture doesn’t seem quite right if you just put all the ingredients in the pan and bring it up to the boil. Adding boiling milk to the corn starch really does seem to be the right way to do this. The type of starch makes quite a difference here, too. I once tried making custard with tapioca starch (because I was out of corn starch), but no-one could get past the gelatinous, mucus-like texture, and I ended up putting it on the compost. Potato starch is just about acceptable, in a pinch. Bananas and Custard: a favorite from my childhood. This amount of custard (with 2 ripe bananas) is enough for 2 servings. Slice the bananas into 2 individual bowls, pour the custard evenly between the bowls, and chill before eating. The 4 tbsp of corn starch makes a good, thick custard suitable for trifles as well as serving with pies and steamed puddings. If you prefer your custard to pour more easily, though, reduce to 3 tbsp. As yet, I don’t use food coloring in my custard. I have tried blending a medium sized, cooked carrot into the mixture, but that produced a subtle pink custard. I know some folks will want to use turmeric, but I haven’t tried that yet, primarily because I’m not bothered by cream colored custard. I’ll update the blog once I’ve tried that. And lastly, a note about the non-dairy milk: rice milk doesn’t work here. I know this sounds daft, but I just can’t get the custard to thicken using rice milk. I suspect that rice milk boils at a lower temperature than the cornstarch thickens at, whereas almond milk and soy milk work beautifully. The soy milk makes for a very rich sauce, however, so unless I’m making trifle, our preference is for almond milk, or 1/2 soy and 1/2 water. Plain or vanilla flavored work equally well. Put the milk in a stainless steel pan on the stove top to heat. Put the remaining ingredients in a >1 pint jug, and add just enough of the cold milk (< 1/8 pint) to form a thick liquid when stirred smooth. When the milk starts boiling hard, pour it swiftly into the jug, stirring vigorously as you do so, while the cornstarch thickens the milk. If necessary, return to the pan to reheat or to finish thickening, stirring constantly to avoid scorching. I’m not really one for desserts. I have a few favorites, but I generally focus on savory foods. Here, however, is one of my (and my children’s) childhood favorites. Comfort food! This is not some fancy new combination of ingredients or cooking method, it’s a reminder of an old (tweaked) favorite, and a reference for my girls for when they leave home. I have seen some recipes for this that produce a thin, sweet liquid with cooked rice pieces floating in it, just the way my father-in-law likes it, but this is a thick dessert the way my husband and girls like it (sorry, Alec), soothing, and not too sweet. I really like the taste of dried fruit here, whose flavor gently infuses the rice in the oven, but my husband prefers his plain, so take your pick. 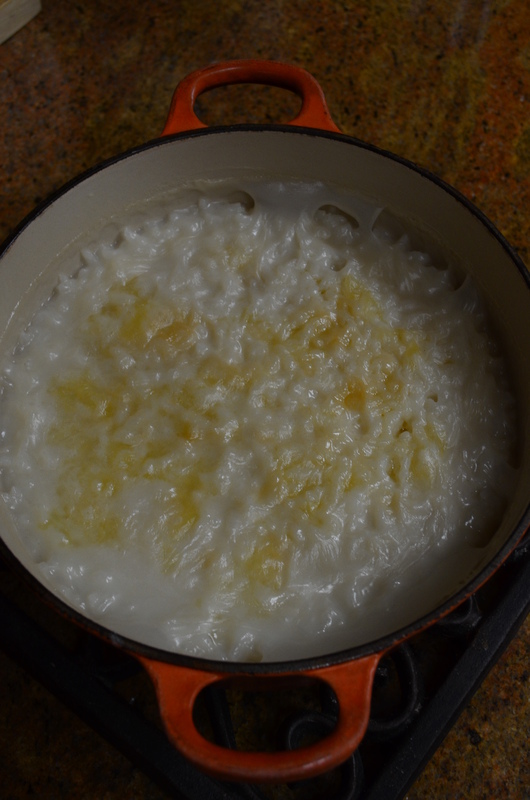 Put the rice and milk in an oven proof saucepan, and bring slowly to a simmer. Allow the rice to simmer gently, stirring occasionally to stop it from sticking to the bottom of the pan, until barely cooked (~15 mins total). At this point, the dish will still look very thin. 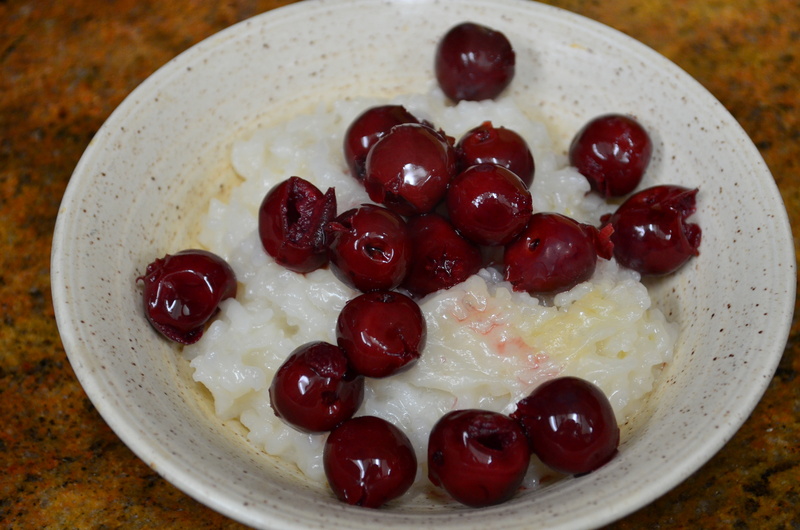 Rice pudding served with tart, jarred, cherries. Stir in the sugar (and dried fruit, if using), then dollop the margarine on the top to melt, sprinkle the top with nutmeg (if using), and put in the oven (towards the top to promote browning), uncovered, to cook slowly at 350F for 40-45 minutes, until the rice has absorbed the liquid, and a lightly browned skin has formed on the surface where the margarine melted. Serve as is, or with stewed fruit. Crumble is a dessert that I have always known. My mother used to make it. My husband’s mother used to make it. Company visiting at short notice, or student friends round for a feast? Pizza and apple crumble (different plates)! Up until a few years ago, of course, the crumble had a wheat based topping, but going gluten free has actually improved the recipe! That’s not something that can be said of most dishes. The improvement is in the wicked marzipan undertones of the topping. In comparison, the original recipe is a little under-flavored. It freezes well (I usually freeze it after cooking) or can be put together in no time flat for unexpected company. The topping can also be made and frozen in advance, ready to top the fruit when ready. This serves about 6 – 8 people. For lots of company, multiply up the quantities and bake in a deep, appropriately sized lasagna dish. 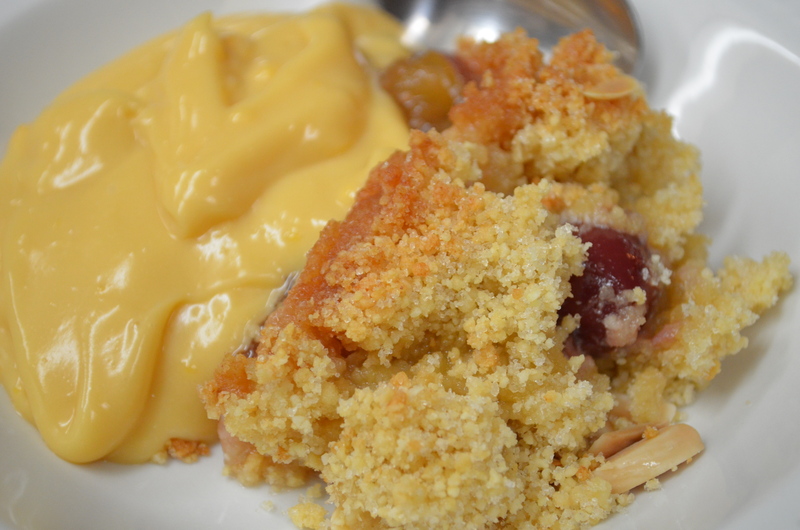 Apple and Cherry Almond Fruit Crumble served with Almond Milk Custard. Put the flours and margarine in a food processor and pulse to combine (or use a pastry wire). Note that the flour and fat need to be combined before the sugar is added. Put the fruit in a medium sized oven proof dish to a depth of about 1 – 2″, and pile the topping loosely on top to a depth of about 1 – 2”, and lightly compress. Decorate top with slivered almonds, if desired. Bake for 30 minutes, or until lightly browned, at 350F. Serve with plain or vanilla non-fat soy yoghurt or custard or cashew pouring creme. Mince pies are another British Christmas treat. I’m sure even the Queen eats them, though her’s would be made with wheat pastry, I’m sure. Their roots are in the middle ages, when they were a savory dish, filled with spiced minced meat. They evolved to contain less meat and more brandy/sugar, so that today, you can get vegetarian versions. We find ours an essential on the run up to the mid-winter holidays. If you’ve never tasted one, know that they are rich and warming, evoking thoughts of rooms warmed by roaring fires while it snows outside. Mince pies made with almond pastry (unblanched almond meal – use blanched for a more traditional white wheat pastry looking crust) and rad whip. The rad whip should apparently whip up stiffer, but I had to get in there and take the photo before the rest of the family ate it all! Margarine for greasing muffin tins. Rad whip, rich brandy sauce, or creamy pouring sauce for serving. Grease the muffin tins well. Take golf-ball sized pieces of pastry, and push with your fingers to line the muffin pans, pushing into the corners so the pastry doesn’t get too thick there. You might well not need a whole batch of the pastry, but it freezes well for future use. Fill the pastry cases with about 2 tbsp mincemeat each. Fashion lids from the pastry dough, if there’s any left. Put in the fridge to cool until ready to put in the oven. Preheat the oven to 370F. If desired, brush the tops of the pies with beaten egg or non-dairy milk, and lightly sprinkle with sugar. Bake, lightly covered with parchment, in the center of the oven for 25-30 minutes, or until lightly browned. Allow to cool slightly before serving hot or warm, with brandy cashew cream.